Thanks for all the comments on yesterday's "Killing time at Target" image. Some asked what exactly they were looking at. 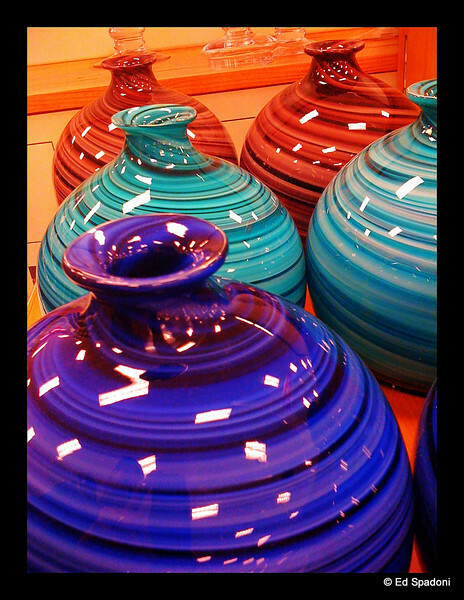 Here's another angle of the large glass jugs as they were arranged on the shelf. Yesterday's shot was of one of the jugs from the top down, processed 4 different ways and combined in a collage. Cool shot! The colors drew my eye right away. Great at any angle, like the quote. Wonderful colors and comp on this shot. sorry I missed commenting yesterday, so I missed the Target shot - I'll go look for that this weekend. You are really talented Ed, and I totally love this shot! I like this shot, too, but yesterday's is so creative. Also, love Picasso's quote! Very apt! Love the colors and comp -- wonderful comp too. Never would've thought to take the photo you used yesterday -- very creative thinking!